The attack on the Paris offices of the satirical publication Charlie Hebdo in January was the most devastating terrorist incident in France since the Algerian War more than five decades ago. Two French-born Muslim brothers affiliated with al Qaeda in the Arabian Peninsula carried out the attack, killing 12 people and injuring 11 more. In the aftermath, there has been considerable debate in France about the extent of radicalization among the country’s nearly 5 million Muslims, and more broadly about the role of Islam in a country famous for its secularism. However, there has been no backlash against Muslims in French public opinion. In fact, attitudes toward Muslims have become slightly more positive over the past year. A new Pew Research Center survey finds that 76% in France say they have a favorable view of Muslims living in their country, similar to the 72% registered in 2014. Meanwhile, the percentage with a very favorable opinion of Muslims has increased significantly, rising from 14% last year to 25% today. Attitudes toward Muslims tend to be more positive on the political left in France, but ratings improved across the ideological spectrum. The pattern is similar to what we found in the U.S. following the Sept. 11 terrorist attacks. Favorable views of Muslim Americans rose from 45% in March 2001 to 59% in November of that year. The increase took place across partisan and ideological groups, with the biggest improvement occurring among conservative Republicans. To many, these changes may seem counterintuitive, especially since much social science research suggests that the more people feel threatened by a minority group, the more likely they are to have negative attitudes toward that group. However, following the attacks in both countries there were widespread calls for national unity, and important statements by national leaders (including presidents Bush and Hollande) making it clear that violent extremists do not represent Islam. Also, as Claremont Graduate University’s Christopher Smith has argued, the media may have helped shape American public opinion after 9/11 by critiquing stereotypes of Muslims and drawing attention to violations of Muslims’ civil liberties. Of course, it is important to note that even though there was no broad public-opinion backlash in France or the U.S., violence against Muslims increased in both countries following the attacks. Among the small minority of people with extremely negative views, some may become more likely to turn to violence after such incidents. 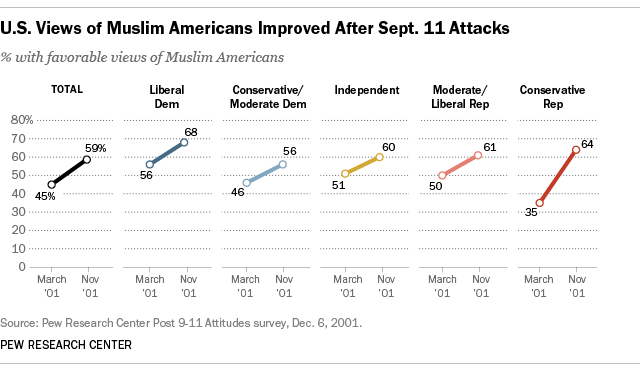 It is also worth noting that favorable ratings of Muslim Americans declined slightly following the post-9/11 bounce. By 2007, just 53% of Americans expressed a positive view, down 6 percentage points from the November 2001 survey though still significantly higher than the 45% in the March 2001 poll. Moreover, the view that Islam is more likely than other religions to encourage violence among its believers has become more common over time. In March 2002, just months after 9/11, only 25% of Americans said Islam is more likely to encourage violence, but this jumped to 44% by July 2003. And the last time we asked the question, in September 2014, fully half of Americans (50%) expressed this view. It remains to be seen whether the improvement in French attitudes toward that country’s Muslim minority will hold, but the topic of Islam in French society will surely be an important issue as the country moves toward presidential elections in 2017.